One of the great things about the modern web is that it is no longer a one way conversation but a means of communication between content creators and their viewers. And at the heart of this lies the simple but effective concept of commenting. This feature started with blogs but has now migrated to everything from traditional news media outlets and online merchants to the ultimate extreme version of commenting, also known as “Facebook” where there is nothing but comments. On this 9th Day of WordPress we’ll look at how you can take regular old blog commenting on your site and make it into a more social experience with a service called Disqus.com. Allowing visitors to comment on your posts creates a discussion around your content and drives people back to the site. But it also attracts the seething underbelly of the internet: The Spammers, Trolls and good old fashioned nutjobs. 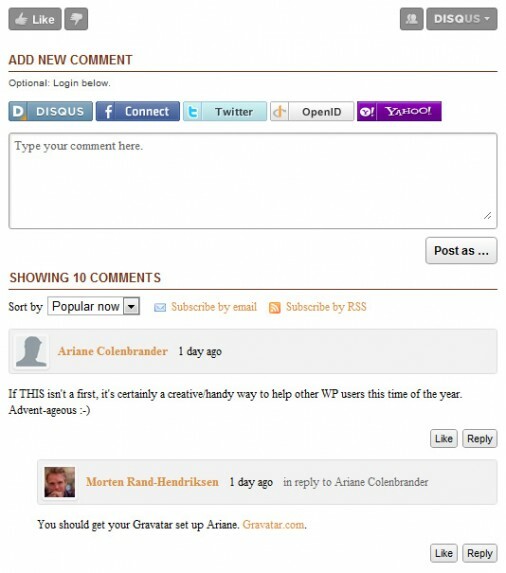 WordPress handles commenting quite well, and with the additon of the Akismet plugin you are fairly safe when it comes to spamming and junk content. But sometimes “fairly” just isn’t good enough. In October comment moderation on this site became a total nightmare. At the time the site was generating close to 3000 spam comments every day, and even though Akismet was well over 96% effective at catching the junk, at least 40 to 60 spam comments would leak through that I had to go in and delete or tag as spam myself. It became a job in itself and very frustrating for the people who actually want to have a discussion or leave a real comment on the site. 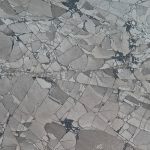 So I did the unthinkable: I shut down commenting! Well, not completely, but I made it hard to comment on the site to get rid of all the crap. This could be detremental to commenting on the site but it had to be done. After the shut down the first time you comment on this site you get a nasty little message saying “Your comment is awaiting moderation” whereupon I would have to approve the comment for you to be allowed to leave more. An unideal situation if ever there was one as was pointed out in an excellent article by UnMarketing genius Scott Stratten in a blog post yesterday called The Five Words That Kill Your Blog. Tratten points out that when you put a wall in front of your commenters so they can’t get the immediate gratification of seeing their words appear on your site, they are going to leave. In other words, the five words “Your comment is awaiting moderation” can be a death sentence where social interaction is concerned. To curb this problem Scott has employed an alternate commenting system from third-party service Disqus. As with pretty much everything WordPress there are alternatives to the native commenting system out there, and Disqus is a fast growing one. It plugs into the core of WordPress through a plugin and inserts itself on top of your normal commenting system. The cool thing is that it not only imports all the existing comments on your site when you fist install it but that it leaves a copy of every comment on your site in case you want to drop it later on. In other words nothing is lost and you are not stuck with the service once you start using it. The reason Disqus is gaining popularity is twofold: First off it uses OAuth (the open source authorization platform used by Twitter, Facebook and other social outlets) for validation so you can log in using a bunch of different social identities. Secondly Disqus keeps track of all your comments left on different sites in one place so you can log in and see all your interactions with different sites at the same time and monitor whether someone has responded to you etc. On top of that there is a like/dislike system and sharing features. All in all a very nice alternative to the native WordPress commenting feature. That was the ‘why’. Now for the ‘how’. 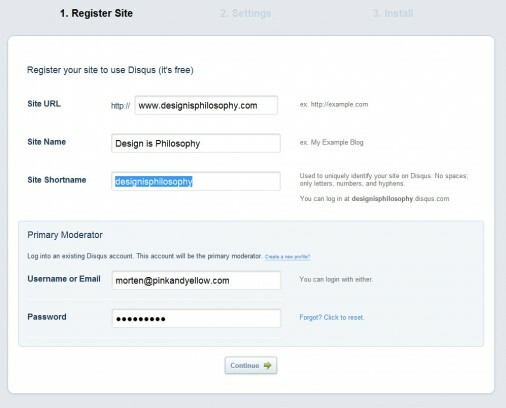 The first thing you need to do is create an account with Disqus: Go to Disqus.com and click Sign Up. On the next page you register your site. It’s pretty straight forward stuff where you leave your site URL, site name and a shortname. You also have to set up the Primary Moderator by creating a Disqus account. On page 2 you get a list of options to define. You can do this now or leve it for later. The important thing here is that you can link your comments up to Facebook and Twitter and also allow your visitors to log in through these and other social networks. 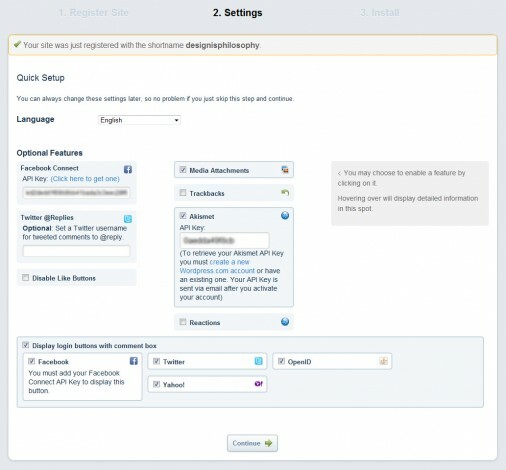 Now just so you are warned, when you get into the advanced features here like Facebook Connect you have to jump through a whole lot of hoops to get everything to work (if you’re wondering how to get your Facebook API check out this excellent walk-through from shoutmeloud.com). It may not be something you should do right off the bat. Like I said, you can always change things around later. When you’ve configured the settings for the site and click Continue you are taken to the core page for your site. Here you can moderate your comments, use the tools, configure and re-configure the settings, add add-ons and most importantly install Disqus on your site. Like any serious application Disqus can be installed on a variety of platforms, WordPress included. Clicking the WordPress logo on the Install page takes you to the installation instructions which are pretty straight forward. Even so, here is a step-by-step breakdown. Disqus has a plugin called Discus Comment System in the WordPress plugin directory. Go to Plugins -> Add New and search for Disqus Comment System to find, install and activate it just like any other plugin. Upon activation you’ll get a warning at the top of the screen that you need to configure the plugin. You can go directly to Disqus from the warning or click on Comments -> Disqus to do this. First you need to log in to Disqus with the username and password you defined when you signed up. This info is also provided in your step-by-step instruction inside Disqus.com if you’re not sure. Disqus now asks you to select a website. Most likely you’ll only have one option here but if you are managing several sites you’ll get a list of them at this point. Select the correct site and click Next. This is where the really cool part of Disqus kicks in. Rather than just taking over the commenting system on your blog and dumping all existing comments you have the option of exporting all your existing comments to Disqus at the click of a button. This way all your old comments will still be visible even though the commenting system has been swapped out. When you click the “export comments” link in the text you are taken to the Import/Export section of Advanced Options. Click the Export Comments button and WordPress and Disqus starts talking. Depending on how many comments you already have on your site this may take a good long while. When the export is done you have to wait for Disqus to import the comments as well. You can log in to Disqus and go to Tools and Import/Export to see the progress for yourself. Or watch some paint dry. Whatever fits your fancy. That’s really all there is to it. Once all your comments are exported they will appear in the new Disqus commenting section. Now all that’s left is for you and your visitors to engage in great conversations with less spam and more social sharing options. Good stuff. I’ll be running some pretty heavy experiments with Disqus in the next months and will hopefully be posting some more tutorials on how to style comments and take more control over the application in the neat future. But for now, if you want an alternative to the native WordPress commenting system, give Disqus a go. It looks like you’re no longer using Disqus for comments. Was there something about it you didn’t like? I’m asking because I am considering switching to disqus for our commenting system, but I don’t want to waste time with it if there are some potential problems that I’m not aware of. I turned Disqus off when I switched to the new theme because I needed to test out a whole bunch of stuff. Never got around to switching it back on. reading another lesson from the blog pages that is presented in the front of the page that it is awesome to make the post like this more in the right way t make the teachings of to the people in the increasing mode! I want to show different comment on my different post but disqus comment system is showing same comments on all post in my wordpress site http://localbazzar.com. Thanks for ur interesting and informative post on Disqus. Very informative article. I’m gonna use this one for sure. I’ve just installed Disqus on my game blog and I love it. Very clean and easy to use, and good spam protection! I just installed Disqus on my blog game and I love it. Protection very clean and easy to use and good against spam! I must say that disqus is a lot easier to use than other commenting widgets. 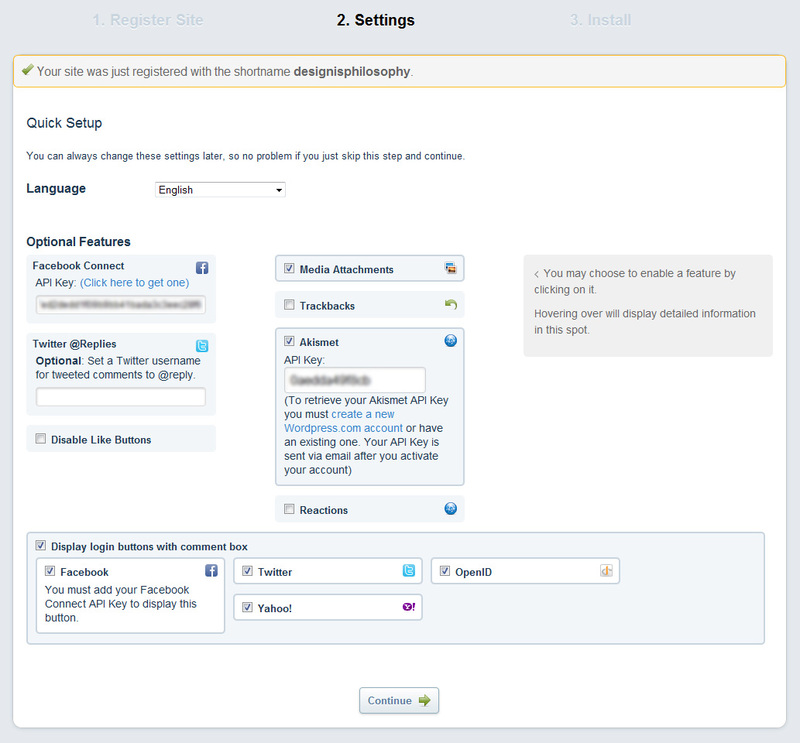 Also, it allows the user to chose which account they will use to post their comments. Nice one! creators and their viewers.” I am completely agree with you. It is always good to receive positive and original comments on content you posted but is very difficult to manage those comments, but yes disqus made it very easy. I recently changed my comment plugin to disqus. it was a nice reading, thanks for sharing with us, mate. Very informative and well written article. It contains lot of info. Thanks for sharing. I used to use a Disqus commenting on my site you can set it up with ease and each page works like a blog itself. Great awesome article there it’s really a useful information. There is some fantastic graphic design in these examples, however I don’t think they do a good job in drawing your eye or attention to a specific message on the page. They cause your eye to jot about looking for something to stand out. The aspire labs does a good gob as it hits me with a benefit straight away, so I can think i’ll keep reading. Most of the others are just examples of design without much marketing. However a great display of graphic design. very few websites that happen to be detailed below, from our point of view are undoubtedly well worth checking out I have recently started a web site, the info you offer on this website has helped me tremendously. Thanks for all of your time & work. Great! Thanks for share this guide and tips.I will try to move it to disqus. since long time. It is vest blog commenting site. Thanks for the awesome poems! Keep up the great work. 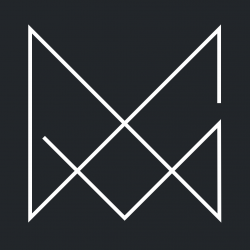 I’m loving your site. You’ve done a great job. Can’t wait to read more. Some say intenseDebate is better than disqus. How are you going to discuss this one? I myself is using disqus for my blogs but now, I am thinking twice if I am going to use the other one on my other upcoming blogs now. Can you guys give thoughts on these? Have been following your sessions and I thought disqus platforms are good since they restrict spammers up to a certain limit. Disqus is good for Spammers, i prefer Facebook Comments or WP Comments. You have a better control of comments!